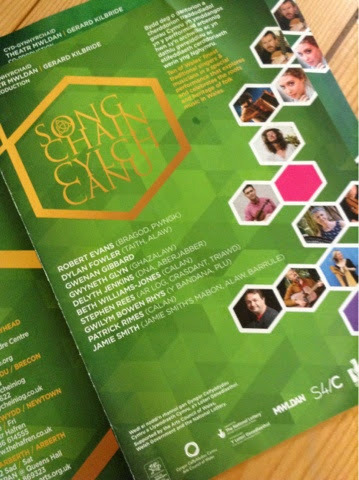 SongChain incorporates ten of Wales’ most talented musicians and singers who deliver a unique and exciting tour enriched in Welsh folk music and tradition. Robert Evans, Dylan Fowler, Gwyneth Glyn, Delyth Jenkins, Beth Williams-Jones, Stephen Rees, Gwilym Bowen Rhys, Patrick Rimes and Jamie Smith; all known for their solo work as well as contribution to bands such as Calan and Jamie Smith’s Mabon; collaborate in this inspiring project mostly based on the heritage of folk music in Wales. During the performances there is, in my opinion, a lovely balance between English and Welsh spoken. Also, Songchain is made special by the leaflets which contain set lists with details of the songs (in both English and Welsh). As the concerted started, to the distinctive sound of the pigorn, all eyes were drawn to the back of the auditorium to watch the dramatic entrance of Partick Rimes, Stephen Rees and Gwilym Bowen Rhys. They walked down the aisle whilst Patrick and Stephen played the pibgorn and Gwilym played bagpipes. The modern tune ‘Y pibydd Llon’ (‘The Joyful Piper’) was followed by the traditional tunes ‘Beth yw’r Haf I mi?’ (What is the Summer to Me?’ The use of these instruments created a really unusual yet distinctively Welsh sound and at times there were some really beautiful harmonies. During this piece the rest of the musicians congregated on stage in silence. They sat in a semicircle behind an area where the musicians performing could stand. This gave the concert a very intimate atmosphere and all the musicians were visibly enjoying watching each other perform. Patrick, Stephen and Gwilym stayed at the front of the stage for the next piece, the sea shanty ‘Mae’r Gwynt Yn Deg’ (‘The Wind is Fair’). The harmonies created during this lively song were particularly enjoyable especially as they sang it unaccompanied, taking it in turns to sing the individual verses. This is just one of multiple songs with a naval theme. Later on in the first half Gwyneth Glyn beautifully sang the song ‘Yn Harbwr San Francisco’ accompanying herself on guitar alongside Jamie Smith’s wonderful accordion playing. This is a very pretty song in which a sailor laments about Wales. The addition of Jamie’s whistling late on the song made it particularly memorable and enjoyable. It was particularly interesting to see Robert Evans play the crwth, which is a stringed instrument played with a bow like a violin but worn round the neck, ‘like a punishment’ as he explained. Robert pointed out that its importance in Wales for 800 years – twice as long as the violin. He played and sang ‘Ar Mhwys Dan Wyro ‘Mhen’ (‘As I Surveyed the Wood Alone’) and the sound of the crwth was very fitting to the melody and Robert’s voice. Another distinctively Welsh form of music that was played was Cerdd Dant. A cerdd dant (or penillion singing) is a form of sung poetry accompanied by the harp. Gwenan Gibbard played ‘Calon Drom’ (‘Heavy Heart) comprising both old and new lyrics. Gwenan Gibbard has a very pleasant voice which really suits this slightly unusual music form. Beth Williams-Jones, Gwyneth Glyn and Gwennan Gibbard opened the second half with the attractive song ‘Adar Man y Mynydd’ (‘The Small Birds of the Mountain’) notable for their harmonies. This was followed by Beth Williams-Jones singing ‘Aderyn Pur’ (‘The Pure Bird’) and ‘Gwcw Fach’ (‘Little Cuckoo’). Although I have heard Beth sing with Calan, I have never heard her sing as well this. She has a very clear voice and the song was particularly engaging when, during ‘Gwcw Fach’, she incorporated rhythmic clogging to go with the lively melody. Dylan Fowler accompanied her with intricate guitar playing. The concert ended with the whole group standing up to sing ‘Carol y Swper’ (‘The Carol of the Supper’). This song was often sung at the end of Plygain services, church services that are held early on Christmas morning. It was a lovely and fitting way to end the concert and one of my favourite moments of the concert. The Songchain tour continues for the next week and will visit various places in Wales. After that, let’s just hope a CD incorporating these beautiful songs and tunes is released. If I were able to, I would certainly go and see them perform again. The most disappointing aspect of the concert at Theatr Mwldan was that very few people attended even though the concert was fantastic. Therefore, I really recommend that you go and see this unique collaboration.